Lucy Terrill was born in 1824 at NY. She married Loomis L. Watrous, son of Wix Watrous and Hannah Liva Cook. Lucy Terrill died after 1880. Marshall Porter Holcombe was born on 7 January 1871 at Springfield, Greene Co., MO. He was the son of Albert Warren Holcombe and Orinda Susannah Porter. Marshall Porter Holcombe married Edna Gertrude Gardner on 18 October 1894 at Beulah, Crook Co., WY. Marshall Porter Holcombe died on 13 November 1942 at Rapid City, Pennington Co., SD, at age 71. Marshall and Edna were enumerated in the 1900 Harding, Butte Co., SD, federal census. He was a farmer age 29, she was 28. Chilldren in the household were Lucille 4, Lorraine 1, and an unnamed infant born in May 1900. Marshall and Edna G. were enumerated in the 1910 Harding, Harding Co., SD, federal census. He was a farmer age 38, she was 32. Children in the household were Lorraine 11 and Eugene 8. Theresa Ward was born in 1838. She married William H. Holcombe, son of Horace Holcombe and Eunice Ormsby, in 1858. Theresa Ward died on 15 April 1870 at NY. She was buried at New Ohio Cemetery, North Colesville, Broome Co., NY. Vernon Holcombe was born in March 1880 at Westfield, Chautauqua Co., NY. He was the son of George C. Holcombe and Addie Campbell. Vernon Holcombe died in 1931 at Westfield, Chautauqua Co., NY. Eunice R. Holcombe was born circa 1860 at Broome Co., NY. 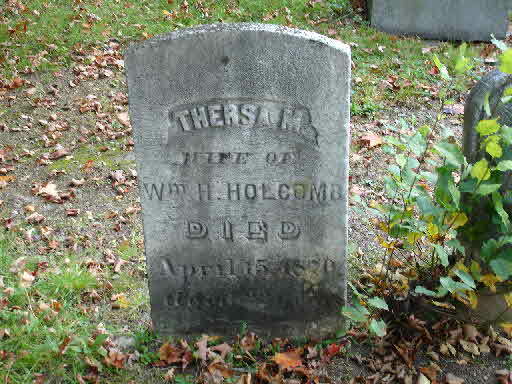 She was the daughter of William H. Holcombe and Theresa Ward. [S182] Social Security Death Index (on-line), Ancestry.com, SSDI, Ancestry.com, ssan 503-24-2880. [S807] Find A Grave, online http://www.findagrave.com, memorial ID 36344359. Wilson P. Holcombe was born on 4 February 1888 at NY. He was the son of George C. Holcombe and Kitty (?) Wilson P. Holcombe died in February 1967 at Ripley, Chautauqua Co., NY. Minerva Loomis was born on 20 August 1789 at Harwinton, Litchfield Co., CT. She was the daughter of George Loomis.2 Minerva Loomis married Roswell R. Rogers on 11 April 1810.1 Minerva Loomis died on 17 November 1867 at Canton, Bradford Co., PA, at age 78. [S137] Elisha Scott Loomis, Joseph Loomis, page 236, no. 3089. [S807] Find A Grave, online http://www.findagrave.com, memorial ID #65270338. Thomas Brown was born circa 1838 at VT. He married Caroline E. Holcombe, daughter of Talcott Pinney Holcombe and Janette Holcombe, on 16 September 1873 at Winnebago Co., IL. [S807] Find A Grave, online http://www.findagrave.com, memorial # 10742092. H. A. and Mary were enumerated in the 1900 Kearney, Buffalo Co., NE, federal census. He was a clergyman age 47, she was 43. They had been married 21 years and had 7 children, 6 still living. [S814] Douglas Waldron, "Apollas Holcombe," e-mail to James H. Holcombe, 19 February 2017. [S807] Find A Grave, online http://www.findagrave.com, memorial ID #117482698. [S818] Edwin W. Strickland II, William Buel, 8-14, page 496. Glen Hansel Girdner was born on 23 January 1897 at Western Park, Elk Co., KS. On circa 1907 his name was legally changed to Glen Clark Girdner to honor the founder of Clarksdale.1 He married Mary Ellen Holcombe, daughter of Horace Apollos Holcombe and Mary Dorothy Webster, on 7 December 1922 at Aztec, NM.1 Glen Hansel Girdner died on 3 August 1988 at Prescott, Yavapai Co., AZ, at age 91. Glen Clark Girdner of Cornville, AZ, registered for the WWI draft on 4 June 1918. He was born 23 Jan 1897 in Piedmont, KS. He was employeed by his father. He had blue eyes and red hair. Jennie C. Beman was born in April 1873 at NY. She married Smith Edward Holcombe, son of Nathaniel Alanson Holcombe and Jennie Fay, in 1898. 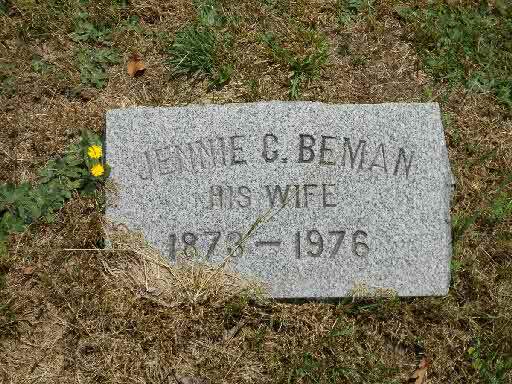 Jennie C. Beman died in 1976. She was buried at New Ohio Cemetery, North Colesville, Broome Co., NY. [S807] Find A Grave, online http://www.findagrave.com, memorial ID #97407404. Barbara Ethel Padgett was born in 1892. She married Hugh Leroy Holcombe, son of Nathaniel Alanson Holcombe and Jennie Fay, on 15 February 1911. Barbara Ethel Padgett died in 1929. Alwin J. Girdner was born on 10 October 1923 at Albuquerque, Bernalillo Co, NM.1,2 He was the son of Glen Hansel Girdner and Mary Ellen Holcombe.1 Alwin J. Girdner died on 15 April 2015 at Albuquerque, Bernalillo Co, NM, at age 91. Mabel Hornbaker married Alfred Wilson Holcombe, son of Lewis Augustus Holcombe and Mary Amanda Emmes, on 19 June 1921. Daniel Girdner was born on 16 August 1927 at Cornville, Yavapai, AZ.1,2 He was the son of Glen Hansel Girdner and Mary Ellen Holcombe.1 Daniel Girdner died on 5 August 2001 at Fontanelle, Adair Co., IA, at age 73. Frances (?) married Alfred William Holcombe, son of Alfred Wilson Holcombe and Mabel Hornbaker, circa 1943. Jessie Terwilliger was born on 22 September 1868 at WI. She married Elmer Holcombe, son of John E. Holcombe and Julia Holcombe, on 6 April 1893. Jessie Terwilliger died on 3 April 1929 at age 60. Eliott Cowles married Sallly Phelps. Edna Jessie Hooper was born on 24 June 1902 at Palmyra, Jefferson Co., WI. She married Orville George Holcombe, son of Elmer Holcombe and Jessie Terwilliger, circa 1921. Edna Jessie Hooper died on 28 January 1958 at Ft. Atkinson, Jefferson Co., WI, at age 55. Eugene Holcombe was born in November 1841. He was the son of Oliver Thrall Holcombe and Jerusha E. Cowles. Eugene Holcombe died on 14 December 1847 at age 6. Mrs. Ettie M. Holcomb, 76, of 546 State Street, died at 12:25 p.m. Tuesday at her home after a long illness. She is survived by her husband, L. Duane of Binghamton [Broome Co., NY]; three daughters, Mrs. J. Allen Scott of Galveston, Texas, Mrs. Edward W. Ernst of Binghamton and Mrs. John P. Ough of Lansdowne, Pa; five grandchildren, and a great grandchild. Mrs. Holcomb was a member of the Chenango Street Methodist Church for 37 years. The body was removed to the George H. Scholderer Home for Funerals, friends may call Wednesday and Thursday from 7 to 9 p.m. Funeral arrangements will be made later. [S807] Find A Grave, online http://www.findagrave.com, Find A Grave, database and images (https://www.findagrave.com : accessed 10 November 2018), memorial page for Ettie M. Holcomb (1868–1945), Find A Grave Memorial no. 95703670, citing New Ohio Cemetery, Belden, Broome County, New York, USA ; Maintained by Paul R (contributor 47317162) . Ronald Glen Girdner was born on 18 September 1936 at Carrizo Nava, AZ.1,2 He was the son of Glen Hansel Girdner and Mary Ellen Holcombe.1 Ronald Glen Girdner died on 22 May 1995 at Cornville, Yavapai, AZ, at age 58. Adelaide Amelia Watrous was also known as Addie Amelia Watrous. She was born on 6 March 1866 at North Colesville, Broome Co., NY. She married Charles H. Holcombe, son of Victnew Holcombe and Sarah Mulford, say 1891. Adelaide Amelia Watrous died on 29 May 1910 at North Colesville, Broome Co., NY, at age 44. Lawrence V. Holcombe was born in December 1886.1 He was the son of Marshall A. Holcombe and Henrietta (? )1 Lawrence V. Holcombe died in 1964. Gladys W. Holcombe was born in March 1899 at NY.1 She was the daughter of Charles H. Holcombe and Adelaide Amelia Watrous.1 Gladys W. Holcombe married Earl W. Babcock on 5 October 1920. Gladys W. Holcombe died on 6 August 1975 at Hillcrest, NY, at age 76. (?) Hunter married Adelaide S. Holcombe, daughter of Oliver Thrall Holcombe and Jerusha E. Cowles. Ola Furman was born in 1903 at NY.1 She married Earl Watrous Holcombe, son of Charles H. Holcombe and Adelaide Amelia Watrous, circa 1922.1 Ola Furman died on 1 May 2001 at Norwich, Chenango Co., NY. Marguerite G. Warner was born circa 1897. She married Earl Watrous Holcombe, son of Charles H. Holcombe and Adelaide Amelia Watrous, on 26 January 1916 at Colesville, Broome Co., NY. 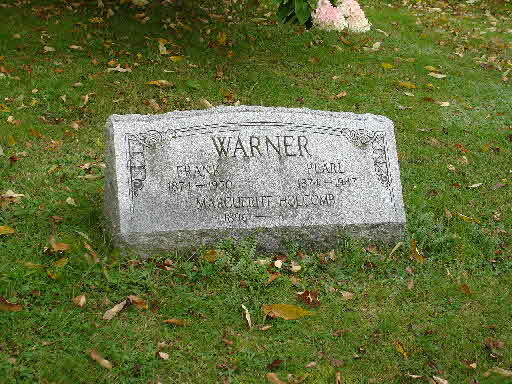 Marguerite G. Warner died possibly before 1922. Harold Alwyn Holcombe was born on 28 August 1885 at MI.1 He was the son of Horace Apollos Holcombe and Mary Dorothy Webster.1 Harold Alwyn Holcombe died say 1909. Lula M. Wedge was born circa 1898. She married Glen W. Holcombe, son of Charles H. Holcombe and Adelaide Amelia Watrous, on 15 September 1920 at Colesville, Broome Co., NY. Richard Campbell married Ruth Esther Holcombe, daughter of Horace Apollos Holcombe and Mary Dorothy Webster. Minnie Jane Canniff was born on 10 April 1929. She married Charles Lee Holcombe, son of Earl Watrous Holcombe and Ola Furman, on 27 July 1946. Minnie Jane Canniff died on 15 October 2010 at age 81.